Exceptional customer service starts with confidence. It is one of the most important components of delivering great service to your customers and developing quality employees. After all, customers want to know that the employee they are dealing with knows what one is doing and they get served in a professional manner. If they have a question, they need prompt and honest answers and if an employee does not have an answer, they want to be sure that the representative is committed to getting it. The second part of his answer speaks to me. I think each one of us knows from experience that when we know what we are doing, the question of confidence doesn’t even come into play. When you know something, you may need to watch out not to become cocky, but quiet confidence comes natural. When applied to customer service, this means that if you want you reps to be confident in front of customers, they need to be well trained and prepared to answer any type of questions. Below are a few tips that will help you to train more confident and successful customer service representatives. It’s important that the rep has a first-hand experience using the product or service you are offering. I’m sure many of us had the experience of dealing with a company rep, which we could clearly tell doesn’t know the product. That is very frustrating, because you immediately feel that the conversation is pointless, as you seem to know the product better than the rep and of course they cannot help you. For this reason it is necessary to give time to employees to explore your products and services in-depth and challenge them with difficult tasks or questions. You can, for example, pull up a few of the most difficult customer cases you had in the past and give them to your employees to solve. This will give them the opportunity and motivation to go beyond the basics and explore the products and services deeper. To be more confident during real-time communications, reps need to be trained in most common types of interaction they will have with customers. A good approach here is to segment the questions your customers typically ask and show your agents how to best answer those questions. Additionally, it is good to give training on the different types of customers that may contact support and explain to the agents how to build their line of communication with those clients. One of the things that helps confidence immensely is sincerity and honesty. If the employee is forced to lie to a customer about something, they will not feel confident in that conversation. They will be even more lost and confused if they feel they need to lie to their employer about some mistake they committed with the customer. It is really important to create an atmosphere or trust and friendship within the company, where mistakes can be freely and openly acknowledged and even laughed at. It is impossible to avoid making mistakes altogether. However, honestly acknowledging mistakes and understanding why they happened is the shortcut to reducing them in the future and feeling more confident. You can really train great performance if you trust in your reps and give your support. Saying “thank you” for the work that your reps do in making your customers happy is essential to help them stay confident. Without positive feedback it is very difficult to remain confident. After all, one feels confident when he or she does something for others and they value it. By now, it’s a well-known fact that employees aren’t feeling valued at work. When asked what leaders could do more of to improve engagement, 58% of respondents replied “give recognition”. There is really no such thing as “too much recognition”. Positive feedback has the power to make your reps feel more competent and confident while at the same time improving their productivity. Doesn’t that sound good? Customers like to deal with confident employees, because confidence signals them at least two things, that the person they are dealing with is knowledgeable and they are honest. 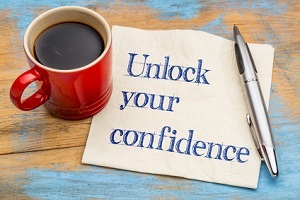 Confidence can make great impression on customers and make them want to deal with you further. Pay attention to the confidence levels that your reps are showing and help them to build more of it. What other tools rather than those discussed above would you use to boost confidence in your customer service reps? Please share your tips and ideas in the comments. This entry was posted in Articles, Best Practice, Tips and Tricks and tagged 5 tips for more confidence in customer service, building confidence in customer service reps, confidence customer support, confidence in customer service, training customer service reps for confidence. Bookmark the permalink. Excellent suggestions. I think just about everyone who has worked in customer service has experienced a confidence-shattering moment, especially when they were knew and didn’t know the products or systems as well as they should have. Thank you for your comment, Jeff. Great post on the overconfidence! Wonderful thoughts. These are all great points. I believe that this kind of service makes the difference in a great company, and a so-so company. I know of one company’s customer service department that only wants their customers to email in problems, or to leave voice messages on the phone (they don’t answer the phone). So sad, the are missing the point of customer support. Hello Karil. Thank you for your comment. As for lack of phone support, I think in this day and age it is a norm. Technology is offering us so many new, convenient and cheap communication methods that many companies prefer to switch to them. This lowers the cost of support for the company and eventually, the cost of the product or service for the customer. Many times, it is also much more convenient to the customer to email in, live chat or send a voice message. I think this just needs to be transparent. It should be stated clearly which communication channel the company encourages their clients to use. This will eliminate all the confusion and set the customer expectation right. Good stuff. The right training is key to having confident representatives. They are competent which leads to trust and from there a great team can emerge. Thanks for the post! Thank you for sharing your opinion, Eddie! Thank you so much for such an expose. Hi, Maria – great & well-thought suggestions! If I may add, perhaps an already well-trained, competent customer service rep can also do some sort of “mentoring” to newly-hired service reps. Of course, their Team Lead may do an overview of the actual job, daily targets, month-end objectives, etc but for the actual “hands-on” training — the senior rep helping out a newbie is an engaging way to boost the former’s confidence. An added PLUS, too in his career milestones. This is how we did it in our telecoms company years ago and it surely worked! We had a very successful mentoring program for our CSRs. Implementing this program gave us very good results, both on the part of the mentor/trainor and the mentee/trainee. Thank you for sharing your experience, Carina. I think engaging experienced reps it’s definitely an effective way to train new employees. Thank you for these very important tips ad most of us in the service industry know that lagging in these five areas can kill your business. I believe confidence comes with knowledge and superior service begins with REALLY Loving what you do and Caring about who you serve and those you serve with. Thank you for sharing your experience, Nare. I agree with you that loving what you do and caring about the customers is what customer service starts with. I believe confidence comes with knowledge and superior service begins with REALLY Loving what you do and Caring about who you serve and those you serve with. Spot on, Eirene! Thank you for your inspiring comment. Stop being confident. If you know what you’re doing, it should be easy.